Install python: I’d already done this, so I can’t describe this step-by-step. But as far as I remember, it was pretty straightforward, installing it like any other application is installed after downloading the python executable from the Download section of this webpage. Download pip from here. If you’re working on Chrome, rightclick the “get-pip.py” link, and select “Save Link As”, as opposed to just clikcing on it. Ensure it is saved as a .py file. Just opening the installed file will cause a python script to run, and pip will be installed (along with setuptools, if setuptools has not already been installed). Most people don’t seem to need this, but I had to add the folder containing python scripts to my Path variable. To do this in Windows 8.1, go to the start menu, type in “System Environment”, clikc on “Environment Variables”, edit the “Path” field under system variables and append “;C:\Python27\Scripts” (or “;whatever\your\python\path\is\Scripts”). Now to test this, type “pip” in the command prompt terminal (Windows+R > cmd). Create a twitter account if you do not already have one. Go to https://dev.twitter.com/apps and log in with your twitter credentials. Fill out the form and agree to the terms. Put in a dummy website if you don’t have one you want to use. Test things out! : Follow a few users, and wait until a few tweets are visible on your home timeline. Then run the “Hello Tweepy” program, and if it works, and you see your home timeline’s tweets, you’re all set! (Be sure to replace the consumer_key, consumer_secret, access_token and access_token_secret fields with their appropriate values first). Srishti and I worked on Setwise Stream Classification Problem. Here are a few quick details. The original algorithm uses min_stat to determine when to classify an entity (it classifies an entity only if the more than min_stat number of points have been received exceeds min_stat number of points). However, it doesn’t mention anything about how to obtain min_stat. In our proposed method, min_stat is determined in a way so that it returns a class profile as soon as possible, but with likelihood of it having predicted the final class profile that it will predict, given all points in the entity, being beyond a certain amount (say, 80%). This is done by using the entire training data, and determining after how many points are used to obtain the fingerprint of an entity, the class profile the said entity is nearest to doesn’t change very frequently. In other words, after using how many points to determine the fingerprint can the class profile be determine with a certainty more than a certain amount. Anchors play a crucial role in determining fingerprints, which in term determines which class profile an entity is assigned to. However, in the original algorithm, anchors remain constant with time. In our algorithm, we propose updating the anchors incrementally with time, offline. While this would cause some overhead, it would make the system less prone to concept drift. This improvement would be of particular interest when parallelizing the algorithm, since the parallelized implementation of the update of anchors would reduce the overhead significantly. Our improved implementation proposes using a distance-based method to measure concept drift, and those entities which cross the distance threshold are classified into a separate “concept drifted” class (with a possibility of being classified in one of the classes when sufficient data becomes available, although we haven’t looked into this in detail). As our project for the semester, Kapil, Tanmay and I will be building a bot that performs Simultaneous Localization and Mapping (or SLAM, in short) under Dr. J. L. Raheja at CEERI (Central Electronics Engineering Research Institute) , Pilani. Here, I’ll be writing about the difficulties we faced, what we did, a few good resources which helped us out, etc. All the code that we’ve written can be found here. The obstacle avoider would be controlled using the Arduino board, via serial communication with MATLAB, which would be processing images taken from the kinect’s depth sensor to do the obstacle avoiding.Thus, we needed to setup MATLAB to Arduino communication (which I had already worked on before, though). The code can be found here. The code requires MATLAB, the Arduino IDE and Arduino I/O for MATLAB. Note that the Serial port takes a very long time to show in the Arduino IDE, and this can be solved by following this set of instructions. This was fairly straightforward, thanks to MATLAB’s Image Acquisition Toolbox. All that was needed in addition to this was installing the Kinect for Windows SDK (I have v1.8 installed). The code can be found here. Of course, this is a continuous video input, and we’ll be using individual images later on to draw onto them easily. 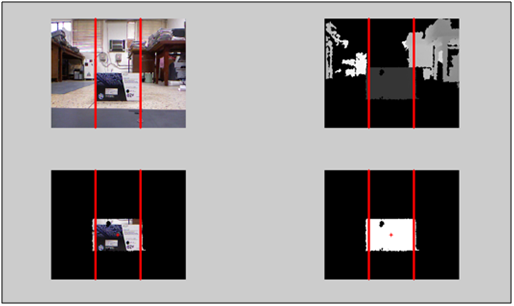 Incline the kinect at an angle from a height, so that an obstacle at the foot of the bot is slightly more than 80cm away. Take the closest pixel’s depth value that is non-zero as the undefined value. Take the closest pixel’s depth value that is non-zero, and use some sort of threshold to determine whether the zero point represents an object closer than 80cm, or one further than 4m. For example, if the neighboring pixels to a connetced component are, say, on an average, 1m away, the entire connected component is likely to represent an object closer than 80cm, while they are, on an average, 3m away, the connected component likely represents a distant object (like a wall) farther than 4m away. Note that in the examples just mentioned, I’ve used the nearest neighbouring pixels’ values’ averages, since a single undefined point is unlikely. Use 2 ultrasonic sensors to get information about when an obstacle closer than 80cm to the bot exists. Account for the size of the object, and use are instead of centroids, so that the bot takes the path with the smallest clutter. Account for distance of objects: at present, the bot merely considers all objects within a threshhold, and ignores objects further away. However, a possible improvement would be that if there are several objects in one direction, and very few in another, the bot would take the direction of fewer obstacles (provided, of course, that there are no obstacles it has to worry about in its immediate vicinity). However, at present, the bot would just continue going in a straight line, even if that would mean more obstacles in the future. Visual Odometry We decided to use the kinect itself for odometry. For this, we would need to estimate movement about the x, y and z directions, and the rotation about the 3 axes. For this, we used the paper “Fast 6D Odometry Based on Visual Features and Depth” as reference. The first step to this would be to use a feature detector. However, SIFT is a little too slow, and it a little over a second for it to be run on an image. Based on the number of resources (“fish”) collected: Whichever bot collects the maximum number of fish before the time runs out would win. In the case of a tie, the bot which collected the first fish would win. Based on health: Each bot was equipped with a cannon, which could be fired to attack another bot. Getting hit by a cannon ball would cost the bot health. If one of the bots loses all its health, then it loses the game, irrespective of how many fish it has collected. Hitting land would also cost the bot/raft to lose health. Thus, there were two aspects to the game: who can traverse the given terrain optimally and collect as many fish as possible, and an adversarial aspect: who would win in an encounter. The bot is not given knowledge about its surrounding, but only about its immediate terrain- parameters like its current position in the map, whether any canon balls within its visibility range are flying towards it, whether there any any obstacles, enemies or fish in its immediate field of view, its current health, etc. There were 4 primary parameters we could control: the direction of acceleration of the bot, whether or not its brakes are applied, whether or not its canon is firing and the direction at which its canon fires. There were several other factors that we had to keep in mind, though, such as mathematical equations representing the viscosity of the water, which meant that we would always have to apply an acceleration, and the equation that gave the braking force. With regards to collecting the fish, we would make the bot traverse the terrain in a random fashion for a certain interval of time (say, 5 seconds), and if the bot remained in approximately the same region, we would then make it choose a direction at random, and continue in that direction. In case it no longer remains stuck (i.e., it was stuck in that location purely due to the random nature of traversal), then the random traversal of the terrain is resumed. In case it remains stuck however, i.e., it encounters an obstacle, it would travel parallel to that obstacle with a left arm on the wall approach, checking for cycles by keeping its starting position in mind. Thus, in a terrain with sparsely distributed obstacles, this algorithm would, in general, cause a randomized traversal of the map such that the bot doesn’t remain stuck in one location, while in the case of a map with a large number of obstacles, the bot would effectively take a left-arm-on-the-wall approach, which would be reasonably efficient in a maze-like environment, for example. With regards to firing the canon, at the start of the game, we randomly fired the canon to the diagonally opposite corner of the screen, where our opponents would likely start, hoping for some stray hits. Then, after we encountered the opponent, and they left our field of view, we would fire in the direction in which we last saw them, hoping for a few more stray hits. There were several other minor details we had to take care of as well, such as ensuring that the bot takes the fish as soon as it sees it, irrespective of where any incoming canon balls are headed, ensuring that the bot ignore the fish if there’s an obstacle in between it and the fish, and ensuring that it ignores the enemy if there’s an obstacle between it and the enemy. All in all, it was a ridiculously fun experience. Proprietary software is generally more popular to use and is easier. At this point, I proposed a solution somewhere inbetween these: To use Windows Ease of Access options, Magnifier and Narrator: Not exactly OpenSource, but already bundled with Windows anyway (i.e., effectively free). We agreed on the idea, and none of us having much experience on these features, decided to try them out for ourselves. Why such software is hardly used in India : The main reason we came up with is that there is almost no awareness about them, and very few organisations and training programmes exist for the same. Further, many students come from a fairly uneducated background, and their parents don’t know how to find such information out, nor are the teachers of a visually impaired child able to guide him/her, as they themselves have little experience with such children. The solution: Talk to NGOs, in due time and have a tie up with them, that we may be able to reach out to these children with their (and possibly the government’s) help. Vernacular Languages: India, being the amazingly diverse nation that it is, has countless languages and dialects. Therefore, a difficulty a blind child is likely to face is actually understanding what the screen reader reads, not only as almost all readers are tailored to read in Western Languages (again, something we weren’t very sure of, and needed to research), but also the accent in which the narrator narrates, which might be difficult for a non-native Englih speaker to decipher. The solution? We decided that the best way of dealing with this was to teach the child English from a young age, although how the child will be able to understand the very different accent, we couldn’t decide. The difficulties they were likely to face: The main difficulty was likely to be actually get blind students accustomed to the PC, as well as to teach them English enough to omfortably ue the PC. What the students can use it for: We had in mind 2 primary goals: Recreation (something that can be enjoyed even without the sense of vision, like music, which also has songs in almost all Indian languages, and which crosses the barriers of language), as well as Education (for example, through audio books, either in English, or in their mother tongue), and perhaps something that melds the 2 together (like an educational game, perhaps). All in all, it was a very good start, and we all agreed that our first focus should be on finding out the most convenient software for these students, in terms of both ease of access and availability, starting with the inbuilt features in Windows.